A few gifts to get you all cozy at the 38Makers holiday gift fair inside the colorful and pintastic Pinterest headquarters! Shop while enjoying free sweet and savory holiday treats and beverages donated by Pinchefs Tony and Danielle of the Compass Group. Shorter days call for long leggings (and hoodies!) from DDCC. Pladra says this heavyweight 100% cotton flannel is ruggedly good-looking. It’s just like you’re wearing Daniel Craig. Tea blends from Tea-We Tea with names that will keep you giggling all winter: Chai Hard, Earl Cray Cray, and our personal favorite, Hay Girl Hay. Gift packs from Cellars 33: This Dogpatch winery is serious about winemaking, but not annoyingly serious about wine. You’ll have fun with these bottles! 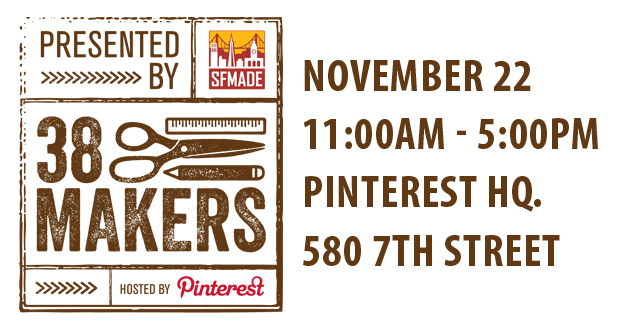 38Makers features jewelry, bags, chocolate, wine, other gourmet gifts, home items, apparel, body products, pet gear, bike accessories, holiday cards and decorations, and stationery – all from local manufacturers and artisans who make their products in San Francisco.